The water that hits your property flows downhill and is part of a larger area, known as a watershed, which drains to a stream, river, wetland or lake. Activities on all of the properties in a watershed affect water quantity and quality. All of the land in Multnomah County eventually drains to the Columbia River, either directly or via the Willamette River, the Sandy River or the Tualatin River. There are also hundreds of small streams and creeks in the rural areas of our county that drain to these rivers. Watersheds come in all shapes and sizes. Don’t judge a waterway by its size or configuration. A “ditch” is often just a small stream. Streams with year-round flow often have fish and other aquatic life in them. Suprisingly, many seasonal creeks are also extremely important to fish, wildlife, and aquatic insect species. Remember that roadside ditches and seasonal creeks flow into fish-bearing streams and rivers, and can impact their water quality. We all live downstream, and we all rely on water. To make sure this resource is safe and available for people, fish, and wildlife, water is a highly regulated resource. Ultimately the responsibility for improving water quality rests with everyone who lives, works, or recreates in the watershed. 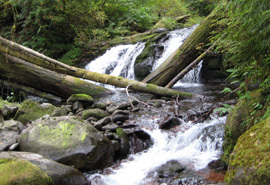 The information in this section can help you protect your watershed. healthy soil, clean water, productive land!